Bananas are one of the most popular fruit varieties in Germany. They are available throughout the whole year as they form very fast-growing fruits in the warm subtropical climate. The harvest is only about nine months. Bananas grow in a tuft of large perennial plants. The origin of the banana is presumed in Southeast Asia about 5,000 years ago. The propagation takes place without seed by offshoot from the mother plant. The fruits available on the German market are primarily derived from Ecuador, Colombia, and Costa Rica. Approx. 80% of the exported bananas come from large plantations; the remaining 20% are produced by small farmers, which are mostly grouped together in production cooperatives. Germany is one of the most important sales markets for bananas. In addition to the sweet dessert bananas popular among us, there are still a few other varieties. The group of cooking bananas, for instance, can be processed like vegetables. Globally, India and China are the largest producers of dessert bananas. However, due to the high level of private consumption in the countries, hardly any exports are made. The banana ranks eighth among the most important crops of human nutrition. It is also one of the most popular fruits in Germany, coming just after the apple group. Overall, every German consumes 12 kilos of bananas per year, or about 100 bananas. This makes Germany one of the leaders in the EU in banana consumption. 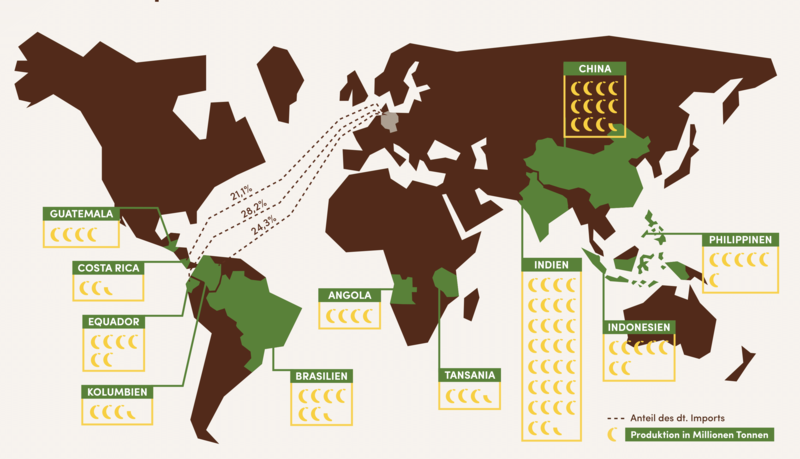 In Germany, a lot is already being done to increase sustainability in the banana supply chain. A large proportion, of the bananas available here, is distinguished by different sustainability certifications. Nevertheless, many challenges remain in the value chain.